Happy Tuesday morning, everyone! Hope your Monday night went well and that you sleep well, too! I'm already up and at 'em with a new review, a Better Late Than Never Review, to be exact. These are for games that are too new to be retro and too old to be considered new. Don't understand? Don't worry about it. You can blame it on having just wakened up. We kick off this Tuesday with a review of an HD version of a Dreamcast classic. If you read this post headline, then you probably know what it is. If not... well.. maybe you need some more sleep. Skating Powered By The "Cel"
Oh, dear Dreamcast, how you met a cruel and quick fate, but your library will forever be heralded for the wild, wacky, and wonderful games you gave the industry and our hobby. 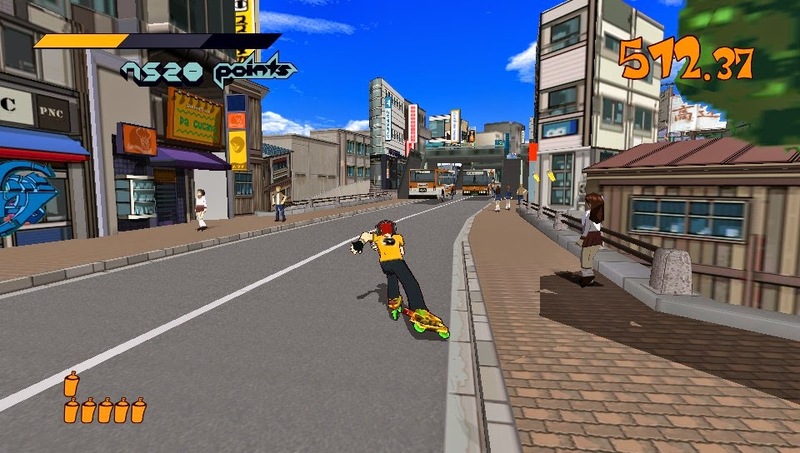 Jet Set Radio (known as Jet Grind Radio originally in North America) was one of those games, and it is well known for being an eclectic title, as well as for pioneering the cel-shaded art style. That alone makes it a winner in my book. However, I didn't actually own a Dreamcast, so the downloadable version on the PlayStation Vita (also available on the PS3 and 360) was my first go at it. While the art style certain holds up to modern standards, the actual gameplay is another story. It's pretty in stills, but it's even better in motion. First, I'd like to just say how fantastic the new high-definition visuals for this digital version of Jet Set Radio really is. The original was a looker and still is today, but this HD remastering is on a whole different level. The colors are bright, vibrant, and pop out splendidly. The characters are modeled with great detail, too. Finally, speaking of details, the levels have seen their geometry upgraded by a sizable amount. Tokyo-to feels even more like an inviting place to skate, grind, and cause trouble for the man in with this HD iteration. not the best of ideas to skate in the street. 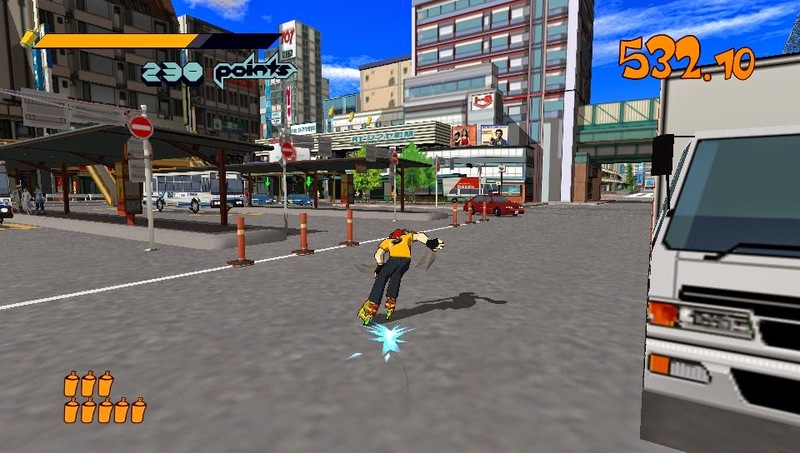 Jet Set Radio has you controlling one of the members of The GGs as you skate, jump, grind, skitch, and spray your way through one of over a dozen individual levels. It's much less like Tony Hawk's Pro Skater and more like a 3D platformer, except instead of a pair of running shoes, your characters wear a pair of inline skates. The goal of most levels is to find and spray over other gangs' graffiti with your own. Once all of these spots have been tagged over by The GGs, you successfully complete the level. The other type of levels have you chasing after three moving targets of rival gang members with the objective to spray each ten times on the back within the time limit. There is no greater diss than marking your territory (in spray paint form, you dirty birdies) on a rival gang member's back. Tab is about to pop open a can on these gang fools! Levels start out as small sections of each of the three regions of Tokyo-to, but as you progress through the game, these small section become interconnected, allowing for some very satisfying exploration, especially if you're a fan of hunting for the elusive Graffiti Souls collectibles like I was! That said, levels are also timed and have everyone from policemen and swat dogs to gang members and attack helicopters attacking you if you aren't careful. The helmets are for these officers' own protection. 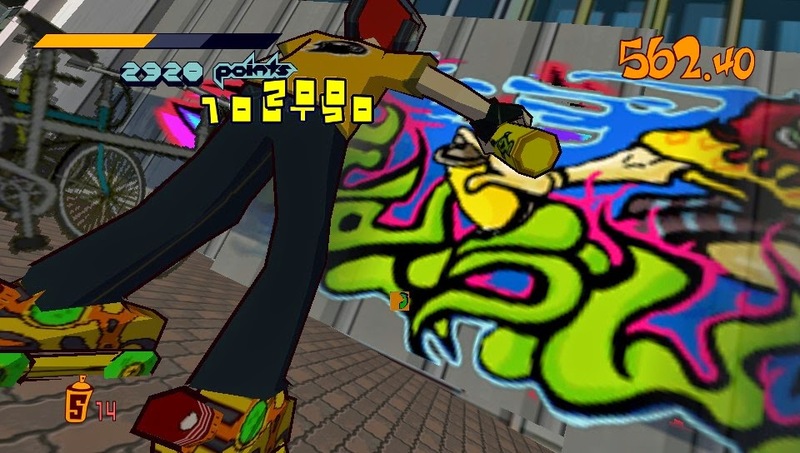 In order to spray over gang graffiti and blank walls, you need to collect spray cans which are littered throughout the many levels of Jet Set Radio. While small graffiti spots only require a quick tap of the left shoulder button to spray them, mid-size and larger spray spots require something less passive. When you spray such a spot, and as long as you have enough paint, you enter a mini-game of sorts where you move the analog stick in the required movements (e.g. a 360 clockwise circle, a counterclockwise half-circle) with quick timing. The more you paint in one fell swoop, the higher the amount of points you get. I call this masterpiece "The Beat Special." Points are not necessary to worry about when just going through the story for fun. However, if you want to unlock every character, you need to get "Jet" rankings on every level. Not only are successful spray painting sessions mandatory, but performing tricks is encouraged as well. 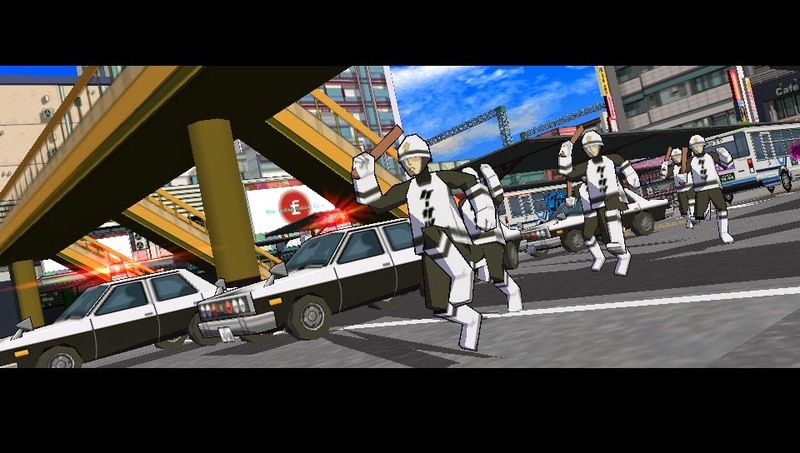 Thankfully, these are limited in Jet Set Radio to nothing complicated. There is just grinding, wall rides, and midair tricks that are automatically performed if you have enough speed... and the game decides it's going to do one for you. in order for you to recruit them to The GGs' side. 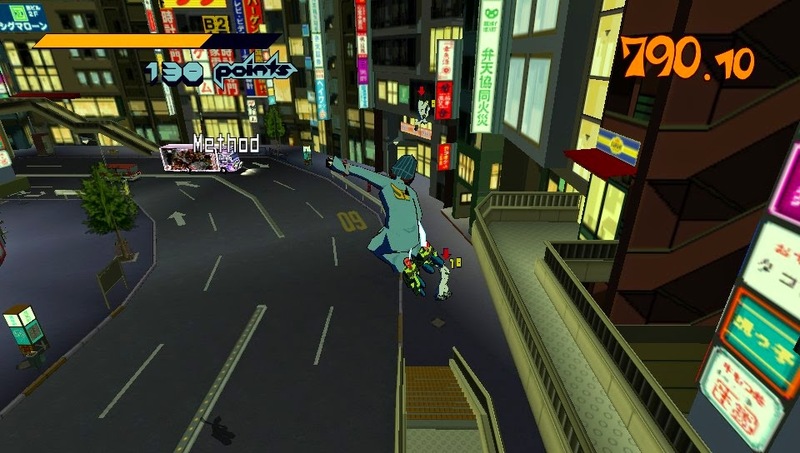 Yes, that is one of the few yet major places upon which Jet Set Radio bails and lands on its face. The game is highly inconsistent. This is no further showcased than in the actual platforming and exploration of the game. A lot of times you will have to grind on a rail to reach higher places. However, this is easier said than accomplished, as there is no grind button to speak of. 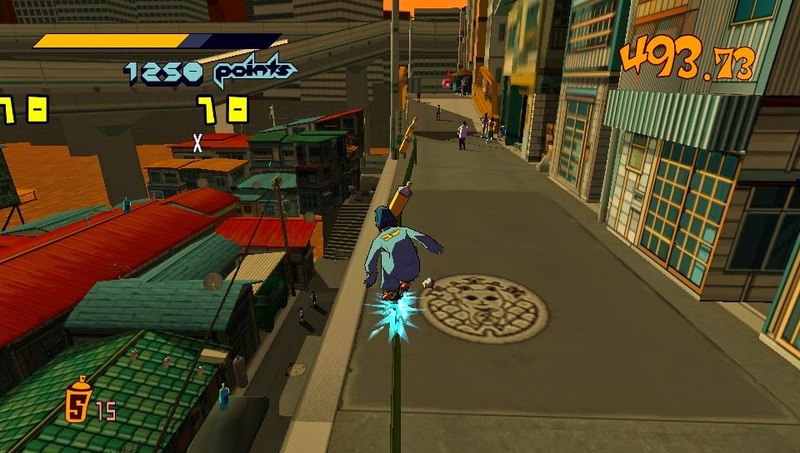 Instead, you aim towards a rail or whatever, and you hope the Jet Set Radio gods deem that you worthy to grind on it. Sometimes it works, sometimes it doesn't. but they don't do their job 100% of the time. How about when you have a lot of speed going into a grind and then magically have all your momentum disappear? Jumping from a platform to something far away is finicky whether you land the jump or not. It is highly frustrating, especially when a fall causes you to have to restart from an earlier portion of a level. Then there is the clunky way each member of The GGs feels. The controls never felt like I was actually in control, which as any video game player worth their weight in ollies could tell you, is pretty counterproductive. Each skater feels very slow, and that's even with the boost ability. 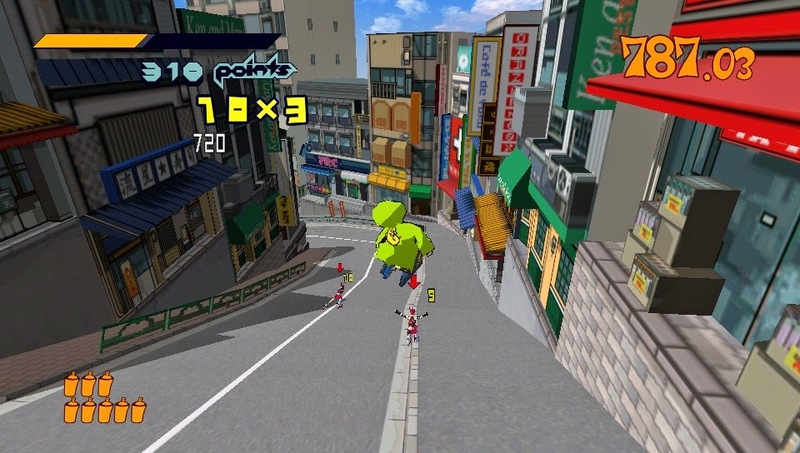 Delicate platforming is sometimes required, and this is pretty much impossible with how each skater controls. Nothing like making a jump only to have Beat, Gum, Dopey, or Bashful automatically turn around, making you fall off the platform with your face burrowing itself in one of your palms. Just a bridge and a Beat with his thoughts. All that said, Jet Set Radio is still indubitably fun even if the actual jumping, skating, and movement mechanics are a bit dated and sometimes archaic. There is a lot of enjoyable exploration of the wonderfully designed levels, great variety of objectives, a killer soundtrack, and undeniable charm emanating from this Dreamcast classic turned digital delight. 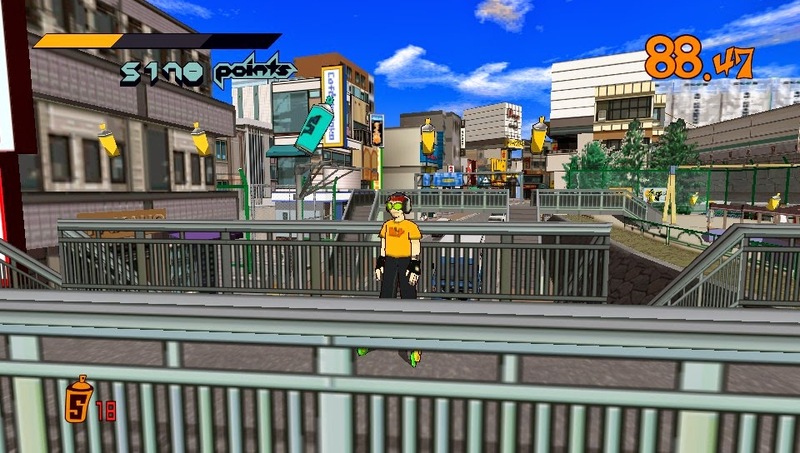 Jet Set Radio does bail and bail HARD concerning some aspects, but overall, it is a wild and worthwhile ride. Just watch out for the Rokkaku!